Swan Professional Chromatic Harmonica 16 Hole 64 Tone Silver. 16-hole/64 tone chromatic harmonica in the key of C, by Swan. The chromatic harmonica can be used for any type of music. New ListingHohner Educator 10 Chromatic Harmonica - Key of C Brand New! Free Shipping!!! 5 out of 5 stars - Hohner Educator 10 Chromatic Harmonica - Key of C Brand New! Free Shipping!!! 1 product rating1 product ratings - Hohner Educator 10 Chromatic Harmonica - Key of C Brand New! Free Shipping!!! HOHNER Super 64 Chromatic Harmonica 7582/64 16-Holes. Huang Octave Bass Harmonica. 30 notes, 60 reeds, octave tuned. Two complete chromatic octave tone ranges begins from contra bass E. (HH-123). 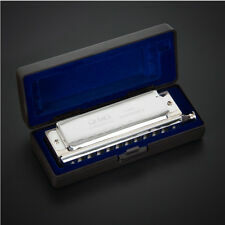 Used HUANG OCTAVE CHROMATIC BASS 60 REED HARMONICA BEAUTIFUL FULL SOUND 2 HARMONICA CONNECTED. Hohner Chromatic Harmonica 270/48 Chromonica 12-hole Key Of C Brand New In Box. Condition is New. Shipped with USPS First Class Package. Has been cleaned and is in good working condition. This harmonica has 16 holes 64 reeds Chromatic Harmonica Key C/C#(Db) with 4 full octaves.The cover plates, the mouthpiece, the slide, the back plate, the U-channel, fully disassembled and had done a detailed cleaning. Trending at $54.90eBay determines this price through a machine learned model of the product's sale prices within the last 90 days. Previously appraised and played by John Popper of Blues Traveler. Item is sold AS-IS by Darrell "The Gambler" Sheets from Storage Wars. It seems to function well but needs a thorough cleaning. The matching wood box and velvet liner are in good condition. Hering 5148 Chromatic Harmonica, used, in Key of D.
Refurbished/Used/Detail cleaned Hohner 280 64 16 holes 64 reeds Chromonica Chromatic Harmonica Key C/C#(Db) with 4 full octaves. The cover plates, the mouthpiece, the slide, and the back plate are disassembled and detailed cleaned. Johnson BK20 Blues Harmonica Key of A. We’ll send it right out to resolve the issue. Also included is Kosso (African Rosewood), Cocobolo and African Blackwood. Also, we will not declare any item as having no value or as being a gift. Harmonicas are in used condition. CX-12 #1 has one note that seems slightly off or out of tune. Item is sold AS-IS by Darrell "The Gambler" Sheets from Storage Wars. The harmonica is pretty dirty. The holes have light rust and residue from use. The harmonica needs to be polished before use. Overall it works great as intended! Do not miss the opportunity to own this great harmonica! VERY SLIGHTLY USED SWAN CHROMATIC 16-64 HARMONICA. 12 OPENINGS, 64 NOTES. 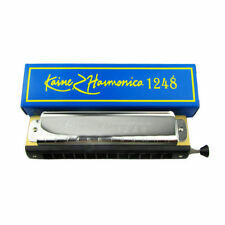 Due to this is a plastic comb harmonica, the reed plates are screw tightened and is made easily cleaning and replacing HOHNER 270 SUPER CHROMONICA. MARINE BAND M. HOHNER NO. 1896 "C" Harmonica w/box. Vintage Tombo Unica Full Chromatic Harmonica. Condition is Used. Tombo Gakki. No 1244. 44 tones. Shipped with USPS First Class Package. Hohner Super 64x Chromonica Chromatic Harmonica Key of C W/ Case -Excellent. Condition is Used. Shipped with USPS Priority Mail. Manufacturer: TOMBO, made in Japan. Condition: New (best buy for a new chromatic harmonica from a reputable Japanese manufacturer). Normal sequence, with a semitone, is a single harmonica full three octaves. HOHNER Chrometta 10C Chromatic Harmonica 10-Holes 253C. Condition is Used. 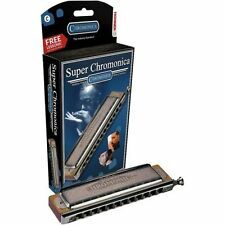 HOHNER Chrometta 10 Chromatic Harmonica 10-Holes 253C. Pre-owned but in EXCELLENT condition. see picture for slight defects and light surface scratches. One of the most popular 16 hole chromatic harmonica on the market. This is the classic 4 octave range chromatic harmonica that gives you one extra octave in the lower range, compared to a 12 hole, so that you can play violin and saxophone parts. The harmonica reed plates nails had been replaced by screws, therefore the cleaning job is so much easier for this one. This harmonica is detailed/cleaned, you just buy and play. The comb has one place broken and repaired(see picture #6 & #7). 12 hole 48 tone chromatic harmonica.phosphor bronze reeds, stainless steel cover plate, Key of C. Factory-direct Authentic SWAN product! The elegant simplicity of the two-part slide / housing concept is a stroke of genius. It‘s never been easier to access the reed plates of a chromatic harmonica. The CX12 is the chromatic harp for all rock, pop and jazz players. 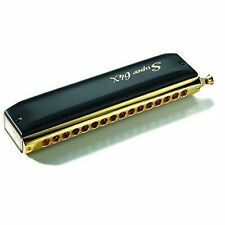 Golden Butterfly WH12 Chromatic Harmonica with Case. Very minor wear from light use. Has been cleaned with sanitizer. TheHering Professional 48 (5148) is the staple of the Hering Chromatic line and is a 3-octave, 12 hole harmonica with 48 reeds, black ABS plastic body and all of the richness that you would expect from Hering. Slide Chromatic Harmonica in C major. - 12 holes. Chromatic Harmonica Silver tone 16 hole 64 Mouth Music Instruments Color : Silver Dimensions: 180 x 46 x 33 mm 16 holes chromatic Note:Do not play this to top to avoid dropping the broken parts in the mouth.Wash with warm water below 40¡ãC, do not use boiling water or alcohol, oil or chemical detergent.Store at ecartde the heat, do not put it near heat or in direct sunlight.Place the harmonica in the box when not in use.1x Harmonica 1 x Cleaning cloth Brand Unbranded MPN Does not apply UPC 4894462266021. • 48 Classic chromonica reeds (full 3 octave range). The classic all-round chromatic harmonica, suitable for all styles. It has not been play tested. Includes case but may not include original box. Hohner Educator 10 Chromatic Harmonica - Key of C Brand New! Free Shipping!! !